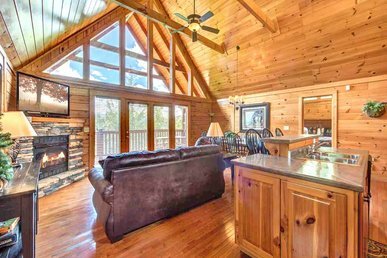 A 3,000-square-foot, 3-story log home, Apple Bear Lodge can sleep up to 18 people. 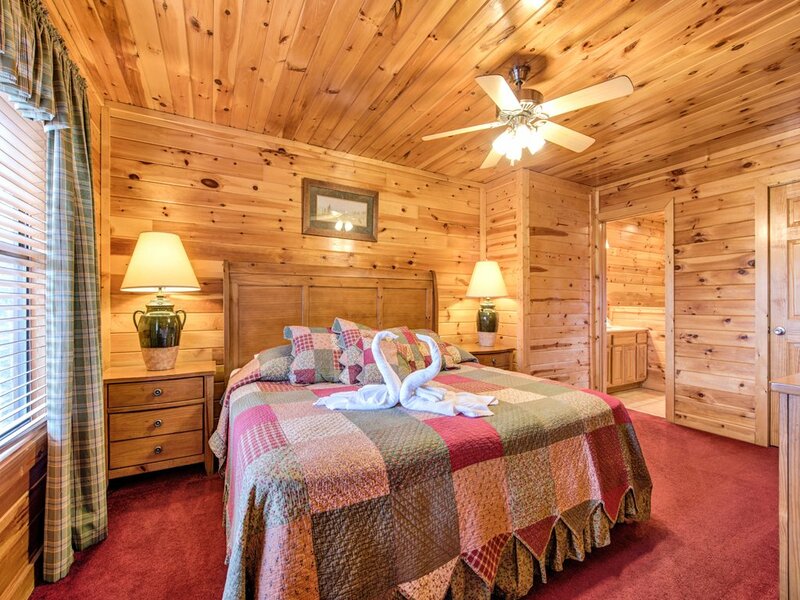 But sleep may be the last thing on your mind once you take note of all the lodge’s amenities, which include a hot tub, a pool table, air hockey, foosball, and free WiFi. 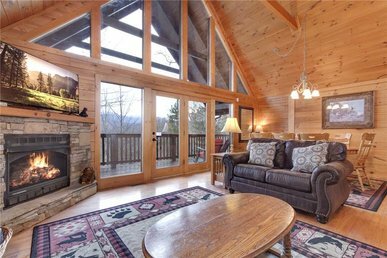 Set atop a steep driveway, Apple Bear Lodge looks out over woodlands toward the Great Smoky Mountains. Its 2 covered rear decks, which span the width of the home, offer plenty of space for the whole group to watch the trees sway in the breeze as to warblers and thrushes sing in the sunshine. 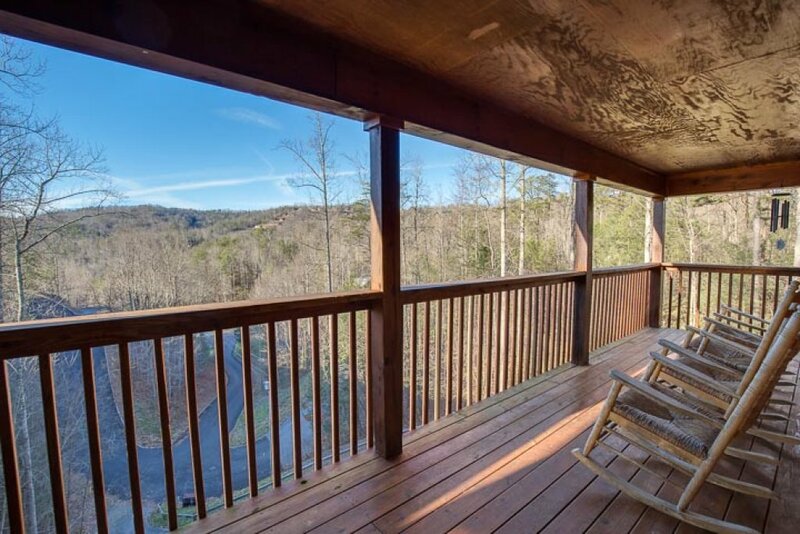 When you’re not kicking back on the deck rocking chairs, you can sit at the main deck’s patio table with a drink and a snack. 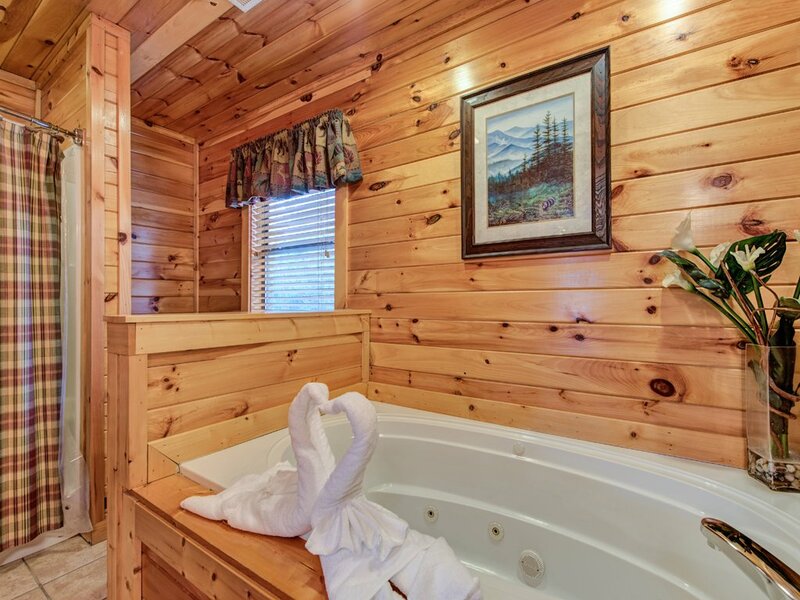 And for a true treat, luxuriate in the lower deck’s hot tub, especially at night: The combination of the steamy jets of water, the star-studded sky, and the serenading of owls and crickets is an experience you’ll long remember. You’ll find plenty more to do inside. 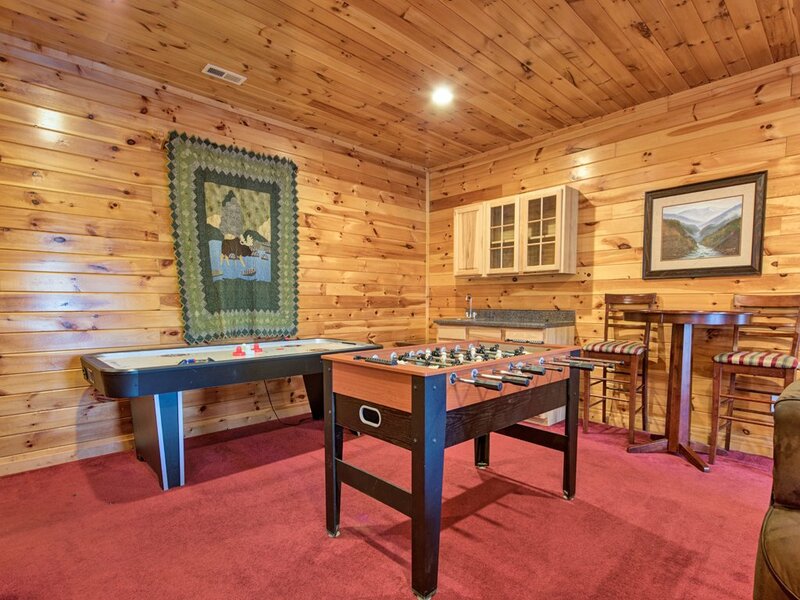 The downstairs game room has something to keep every member of your group entertained for hours. 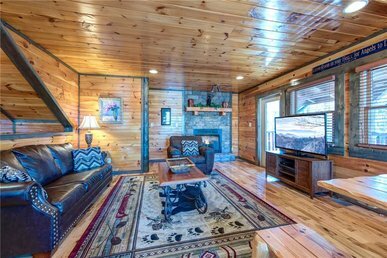 Shoot some pool at the full-size billiard table, challenge friends to a game of foosball or the kids to an air-hockey match, play cards at the pub table, or stretch out on the plush couches and watch a movie on the 60” flat-screen TV. 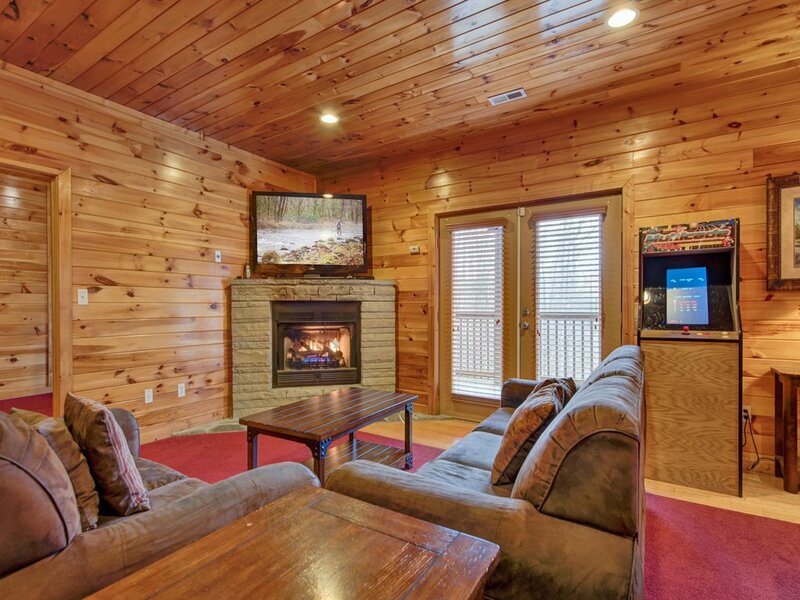 On chilly winter days, the fireplace will keep the space toasty, and the wet bar ensures that no one will go thirsty. 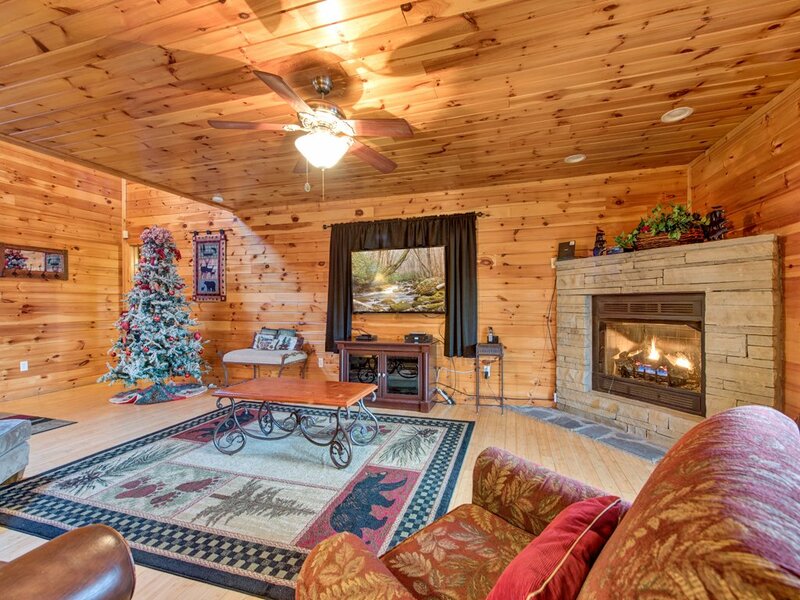 The living room is another inviting gathering spot. 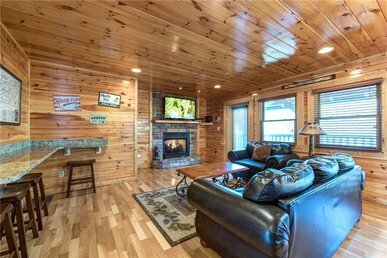 It too has a fireplace, whose golden glow will add to the luster of the wood-planked walls, floor, and ceiling. Stretch out on the leather sofa to watch the big game on the flat-screen TV, or curl up in one of the plush armchairs with your tablet and take advantage of the free WiFi. 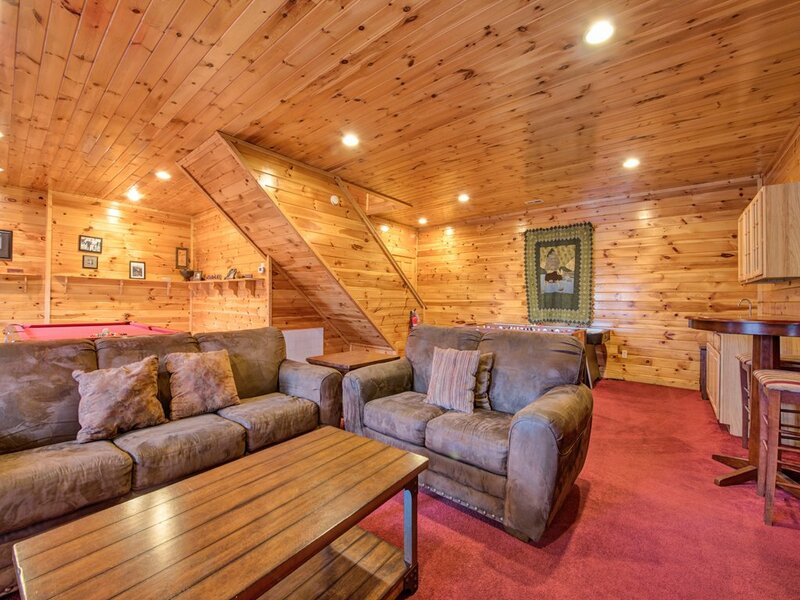 If you’re looking for a quiet spot to read or chat, head to the upstairs sitting area, which like the rest of Apple Bear Lodge is furnished in comfortable, quietly elegant fashion. 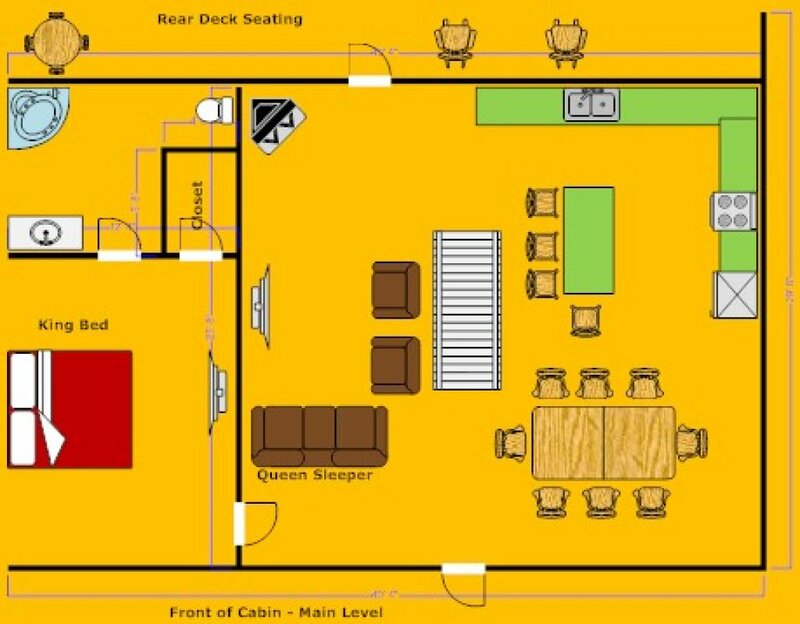 The dining area can seat 12 people: 8 at the lengthy dining table and another 4 at the adjacent breakfast bar. 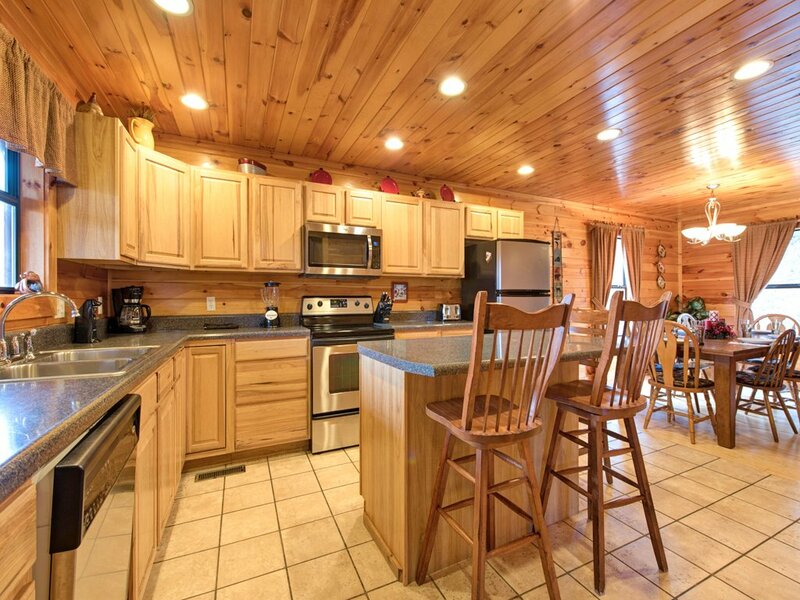 The kids will probably love eating “by themselves” at the breakfast bar while the adults linger at the table. 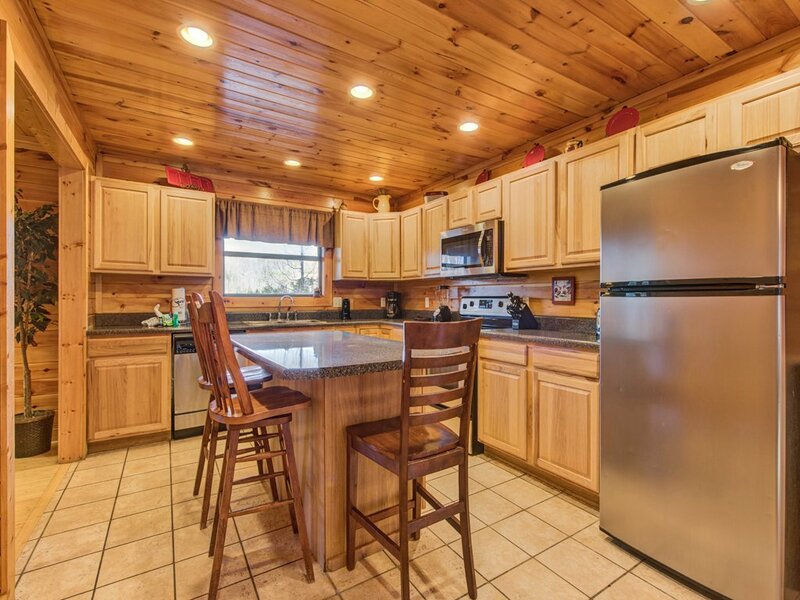 If you enjoy cooking, you’ll love Apple Bear Lodge’s large, open kitchen, with its stainless-steel appliances, ample cookware and tableware, and generous storage and counter space. Even if you don’t plan to cook much, you’ll appreciate having a coffee maker for your morning cup, a microwave to heat up restaurant leftovers, a blender for mixing margaritas, and a fridge for keeping juice boxes cold. 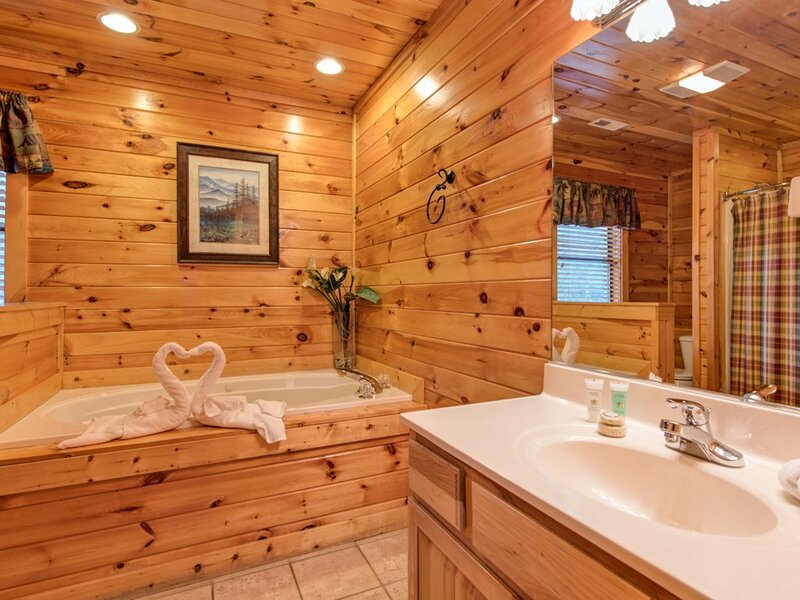 Each of the lodge’s 4 bedrooms has its own bathroom with both a tub and a shower. 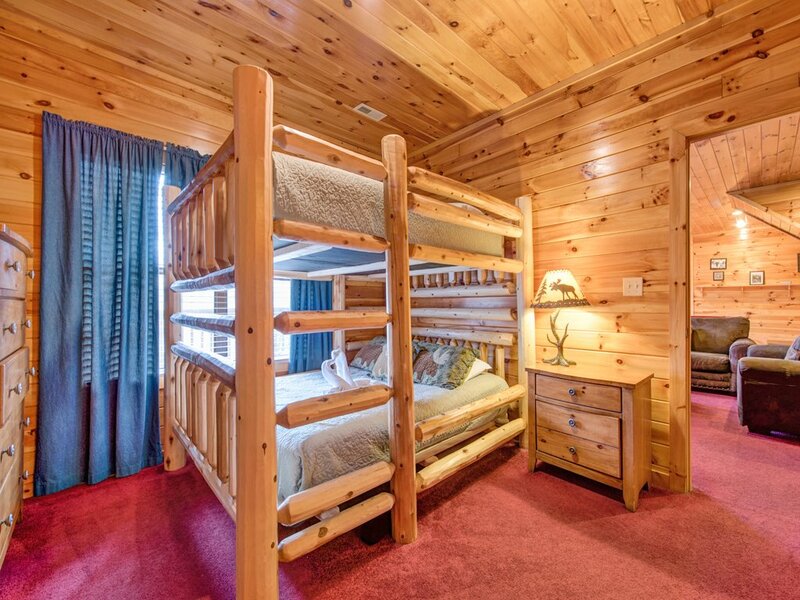 The 2 upstairs bedrooms and the bedroom on the main floor each feature a king-size bed; the 4th bedroom, downstairs, has queen-size bunk beds. 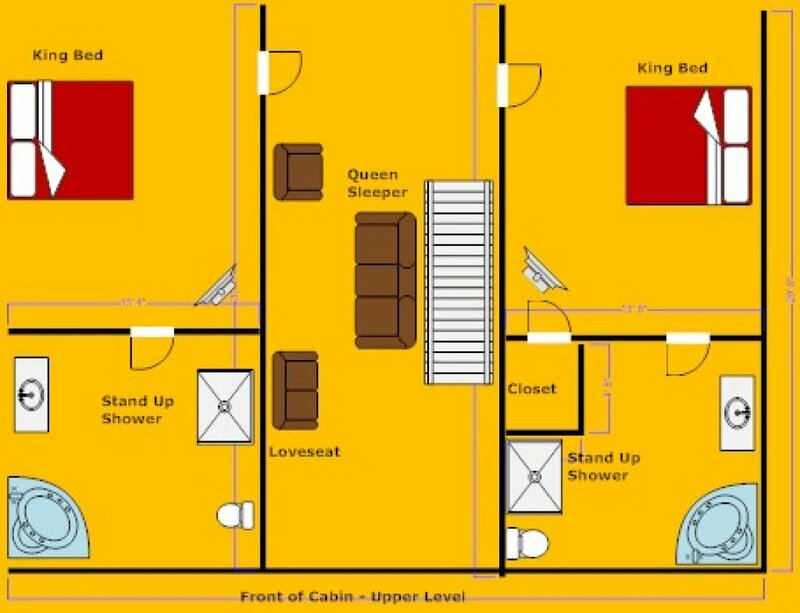 In addition, the upstairs sitting area has bunk beds and a sofa that opens into a queen-size bed; the living room sofa opens into a queen-size bed as well. 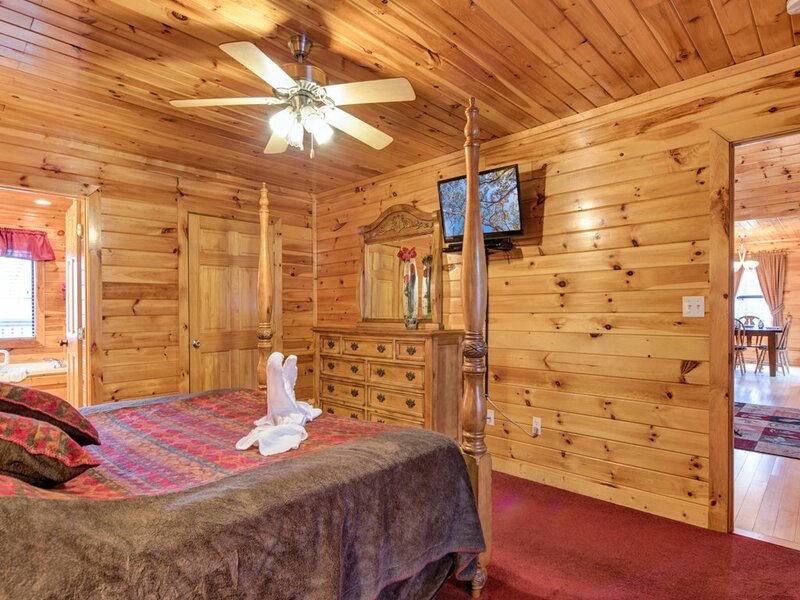 The variety of sleeping areas makes Apple Bear Lodge an ideal option for a family reunion, a wedding party, or several families vacationing together. Not only is there plenty of fun to be had at Apple Bear Lodge, but there’s also loads to see and do just minutes away. 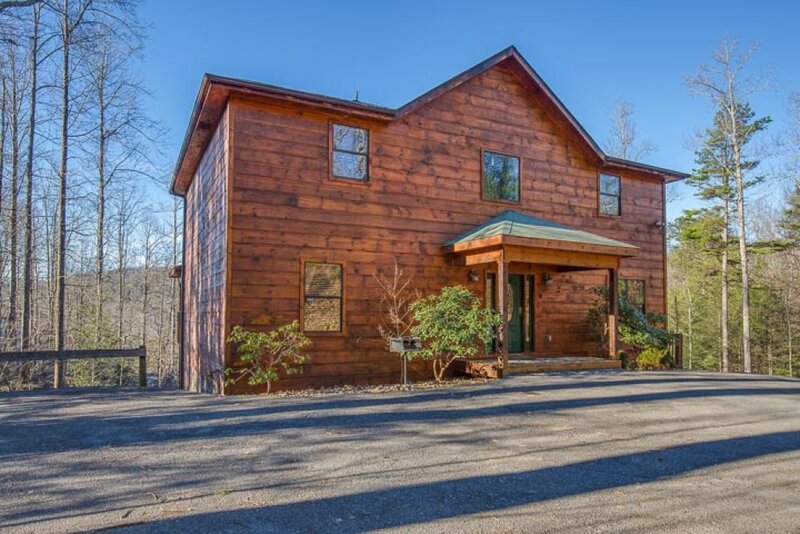 You can drive to downtown Gatlinburg in less than 10 minutes; once there, visit the Guinness World Records Museum, play mini golf, enjoy thrill rides, or ride the tram up to Ober Gatlinburg Amusement Park and Ski Area. 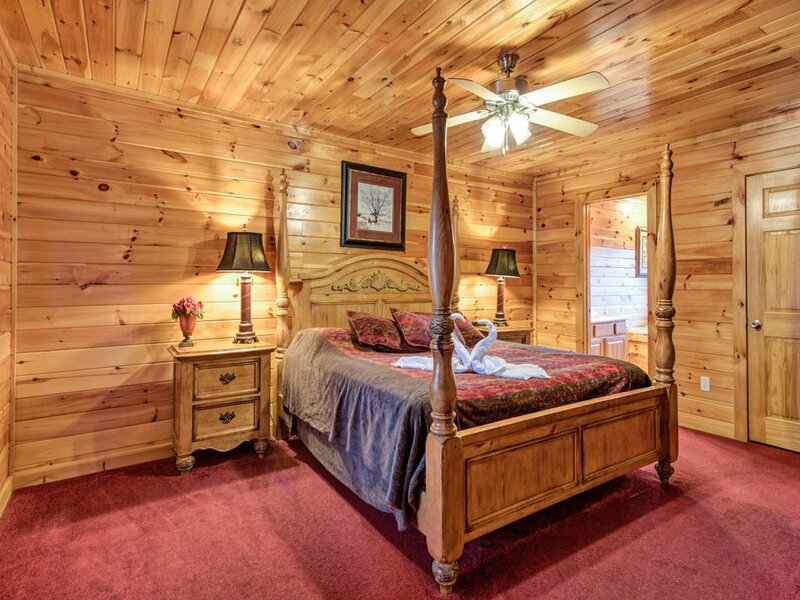 The wildlife, wildflowers, and waterfalls of the Great Smoky Mountains National Park are less than 15 minutes from the cabin, and Pigeon Forge’s attractions, including Dollywood, are less than a half-hour away. 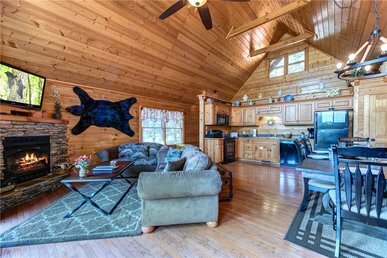 Conveniently located, fabulously spacious, packed with amenities: Apple Bear Lodge really does have it all. So book your stay today, and get ready for what might be your best vacation yet! Great House!! 4.5 out of 5! My husband and a group of our friends went up for a weekend stay in Gatlinburg! 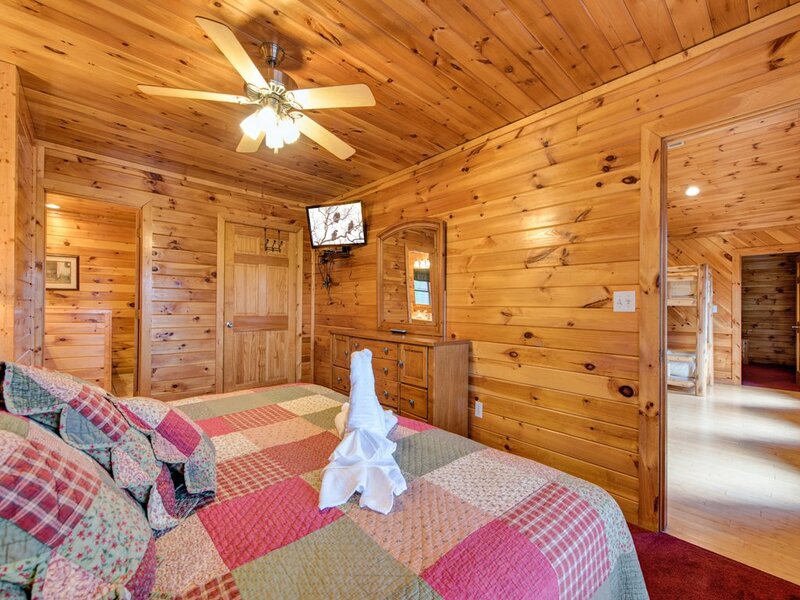 Our time at Apple Bear Lodge was wonderful! The house is huge we could have fit so many more people in it & for a good price! The only drawbacks were a couple of the tubs didn't work properly or were dirty/ had bugs in them which was disappointing. Also the kitchen isn't very well stocked (the bare minimum). However, overall our stay was fabulous and we can't wait to go back! There were 11 of us. Our two daughters, hubbies and 5 grand kiddos ages 8 to 19. There was plenty to do nobody got bored or in each others space since this cabin was so large. 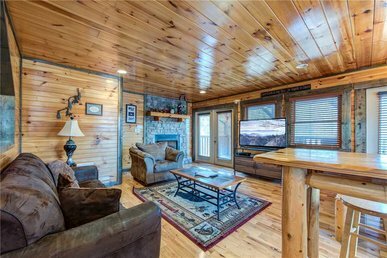 All of us loved the cabin and location. Even all 5 grands told us several times how much they loved it there. The Lodge was Great! There was plenty of room for 14 people. We enjoyed the game room a lot. Beds were comfortable. Location was good, even though the driveway is crazy steep.A few things to mention that need attention or correction. 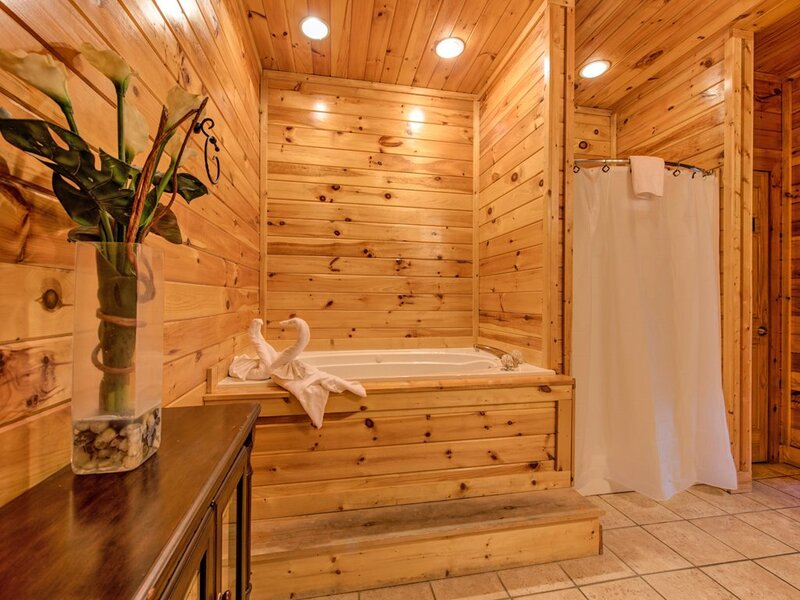 The spa picture is deceiving, it looks like it can fit 6 or more but it is actually a small spa. It was also in economy mode so it only went to 95 degrees. Luckily we found how to adjust it on the internet. The air hockey table has no air. The garbage situation is terrible. There are 2 trash cans that were full when we arrived. We had to stack garbage in the house and load it in our rental van and drive to town to find a place to dispose of it. I'm sorry but that was very frustrating and needs to be addressed. Overall, besides that it was very fun! Thanks for the five-star review, positive comments and constructive feedback. 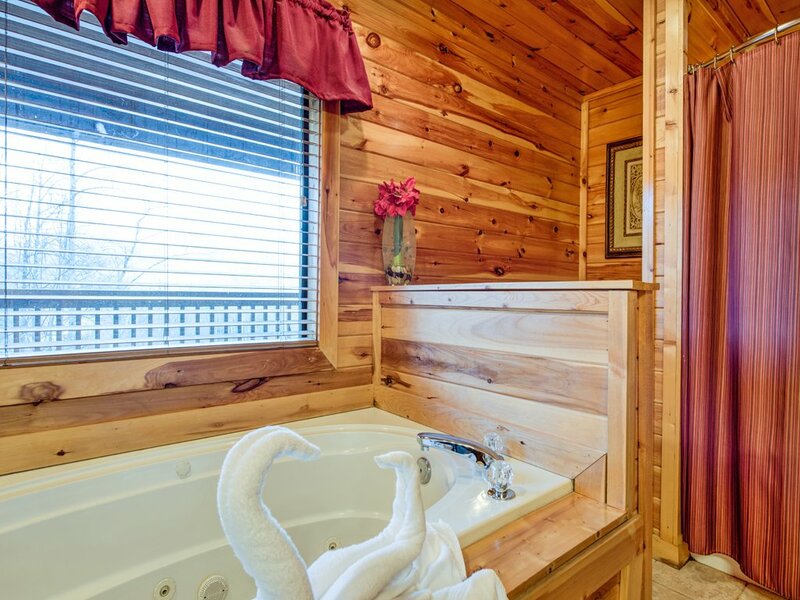 The hot tub is a standard size (four to six people depending on size) and the photo was not photoshopped in any way. I wish you had contacted us and we would have been happy to send maintenance by and bring it out of economy mode (simple reset procedure) or talk you through it on the phone. Economy mode is normally a result of a hot tub not being used for a certain period of time or kids pressing the buttons to rapidly. I apologize for that inconvenience! With the trash, there absolutely should not have been any trash in the cans when you arrived. Clearly that was our mistake and I apologize - we have covered this with the cleaning vendor and it will not impact future guests. In addition, we do offer free mid-stay trash pick-ups - simply call the 24/7 guest service hotline and we will take care of it. Thanks and come back soon! 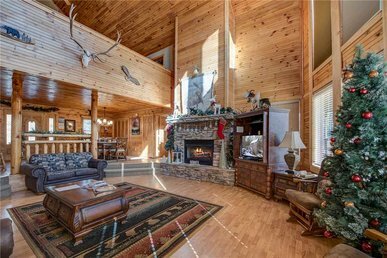 Absolutely amazing cabin! 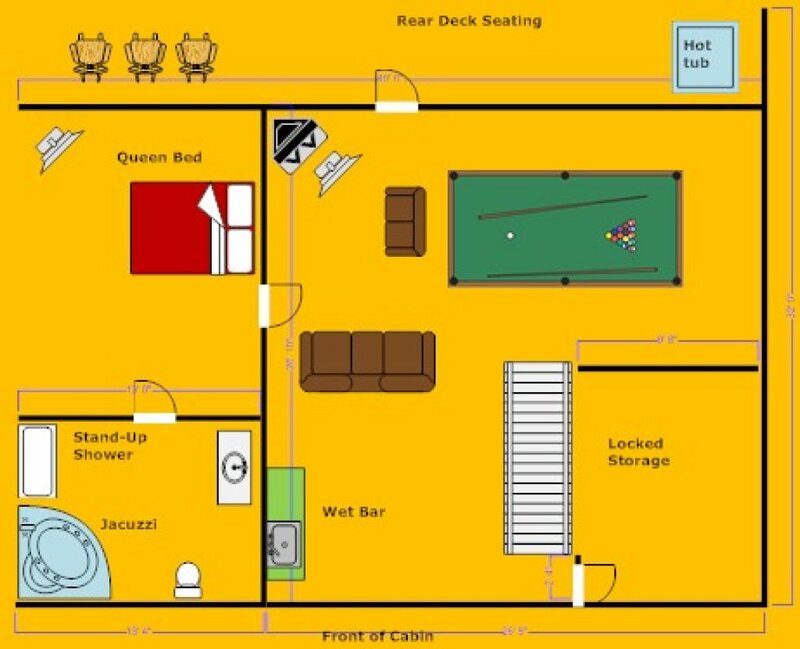 Very large with plenty of space for everyone, even in the common areas. It was private feeling; even though cabins were nearby they could not be seen. Very well stocked kitchen, and very clean. 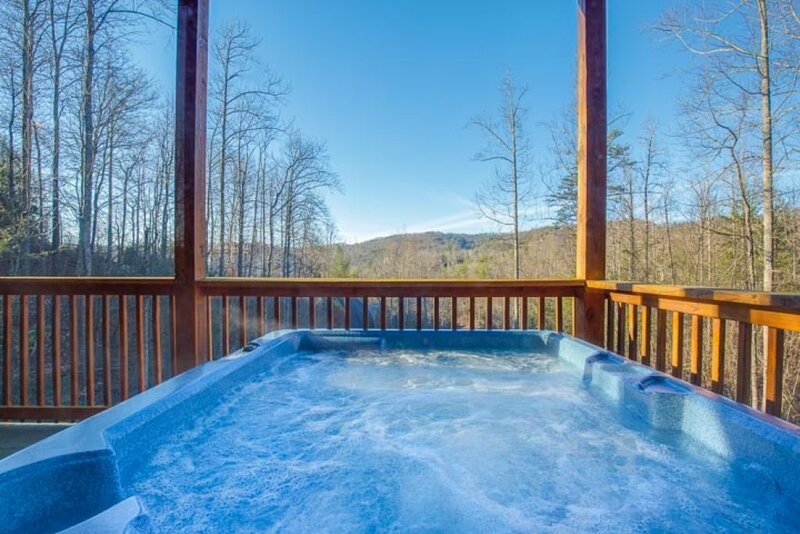 Hot tub worked without a hitch, large covered decks, and great game room. 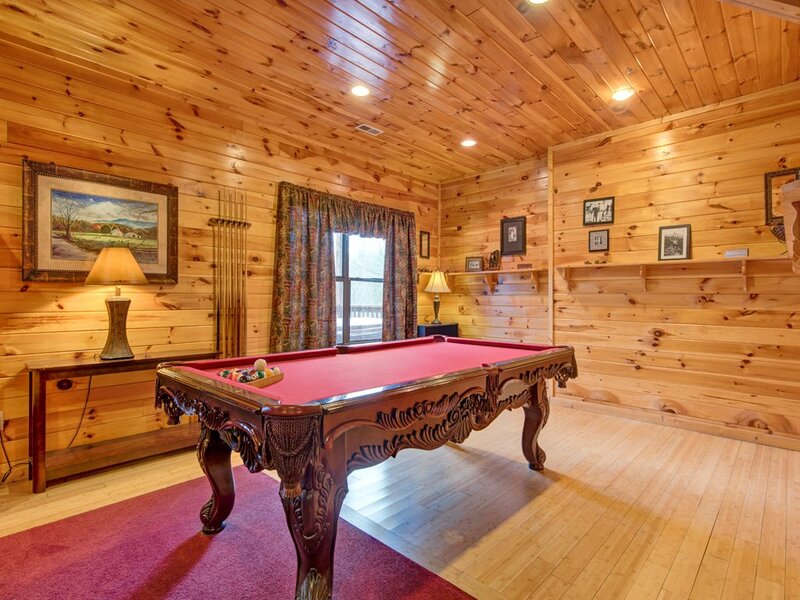 Only disappointment was with my billiards skills lol.. Info beforehand was helpful, and cabin was easy to find. Driveway is extremely steep with turns. We were there first week of October and had good, dry weather. Can't imagine getting up that with wet, or worse, snowy weather!! 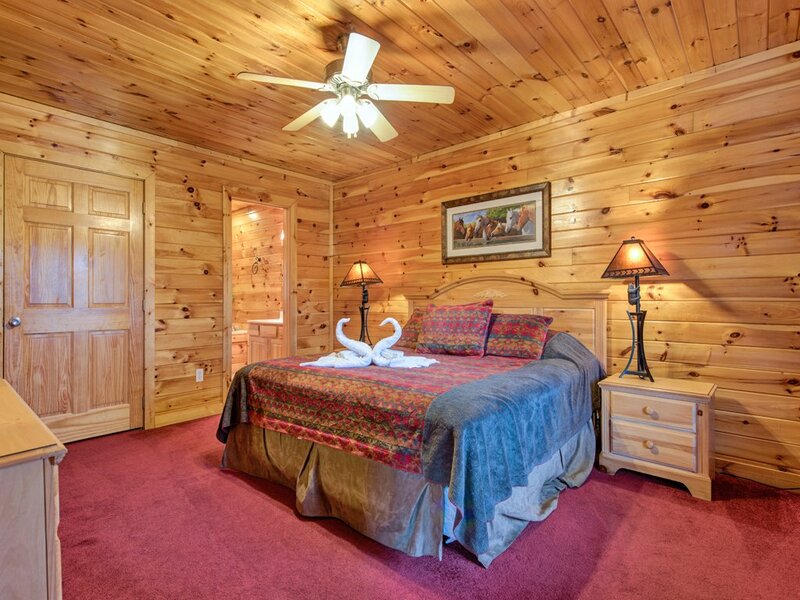 Thanks for the five-star review and positive comments of Apple Bear Lodge! The drive way is steep, but has never been an issue for our guests. Come back soon! 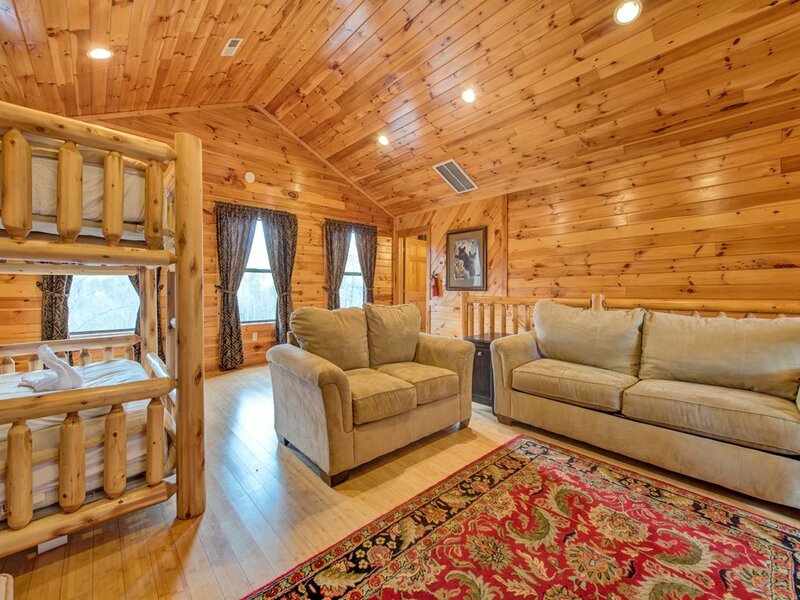 Thank you for the positive review of Apple Bear Lodge - we enjoyed hosting you and your group! You are correct - the driveway is quite steep. That being said, our small four door 2WD work car makes it up/down the driveway without an issue - it just takes a bit of getting used to. :) We hope to have you back again in the near future! 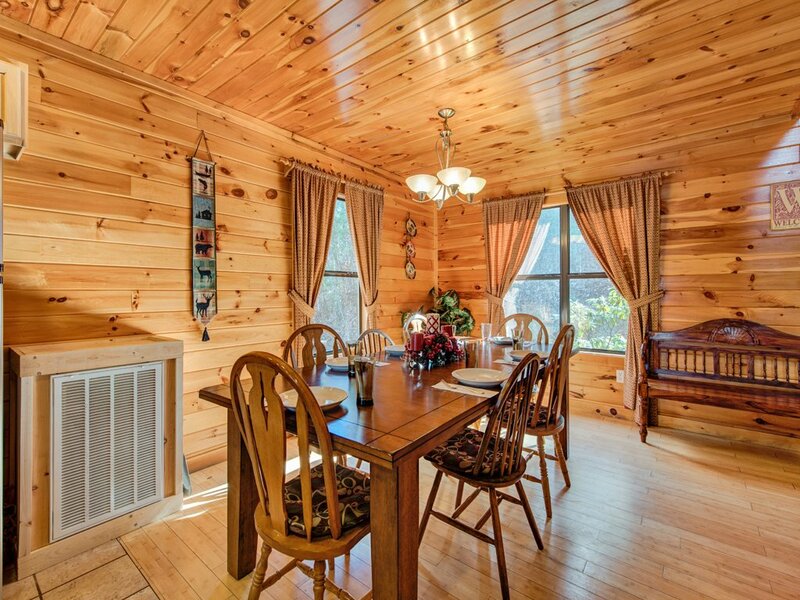 The cabin is fantastic. 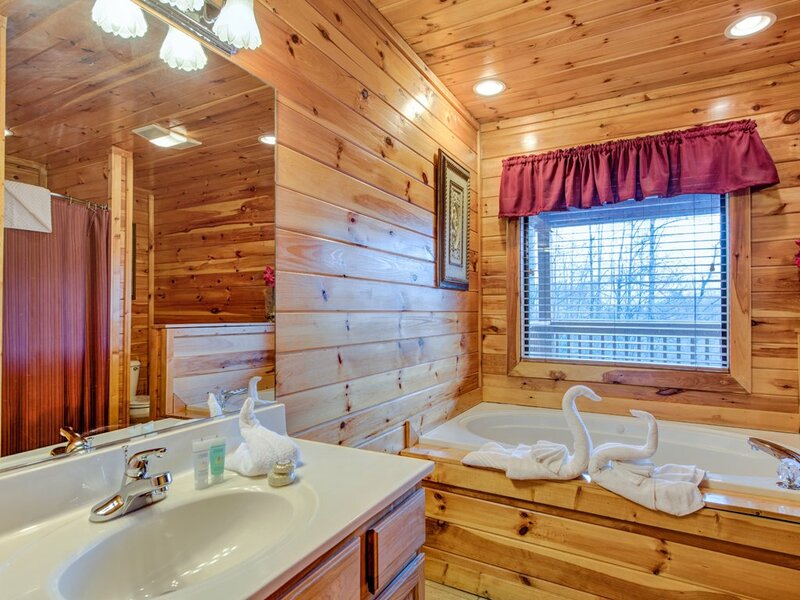 We loved it and all the amenities it had to offer. The location was great. Not to close to town and not to far out. The driveway is very steep. We had a small amount of rain and a few leaves and it was very difficult to get up. We made it, just be prepared. 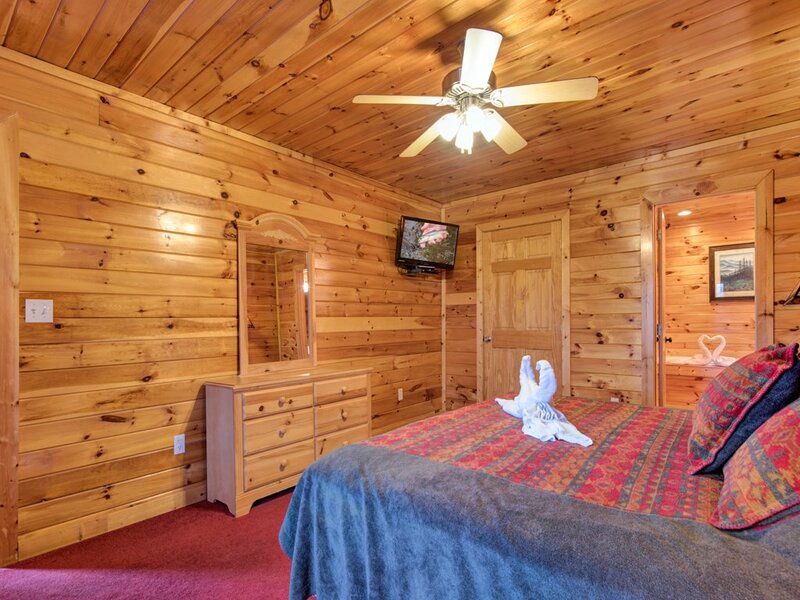 Thanks for your four-star review of Apple Bear Lodge. We appreciate you mentioning that the clean did not meet your expectations - we are following up with housekeeping regarding this issue. Come back soon! Thank you for your review and feedback! 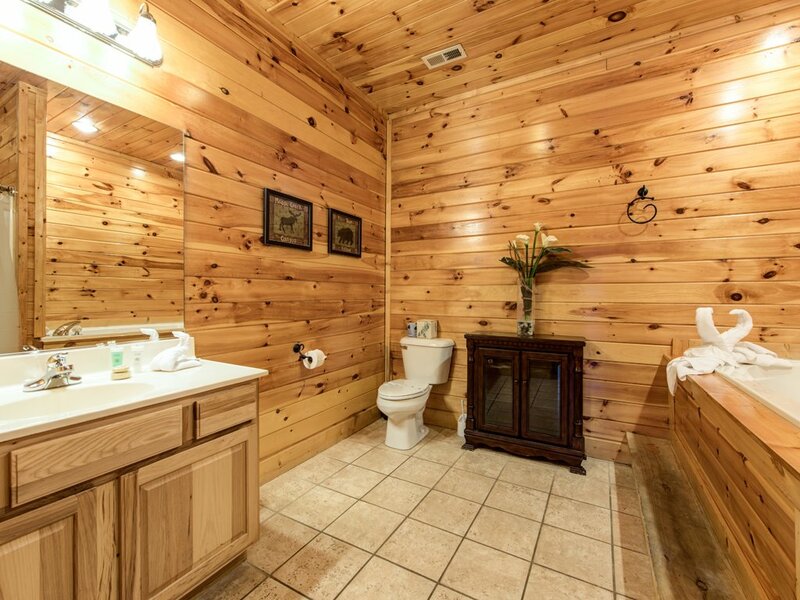 I am sorry to hear that the property did not meet your expectations. I wish you had contacted our 24/7 guest hotline and we would have promptly addressed the issues. 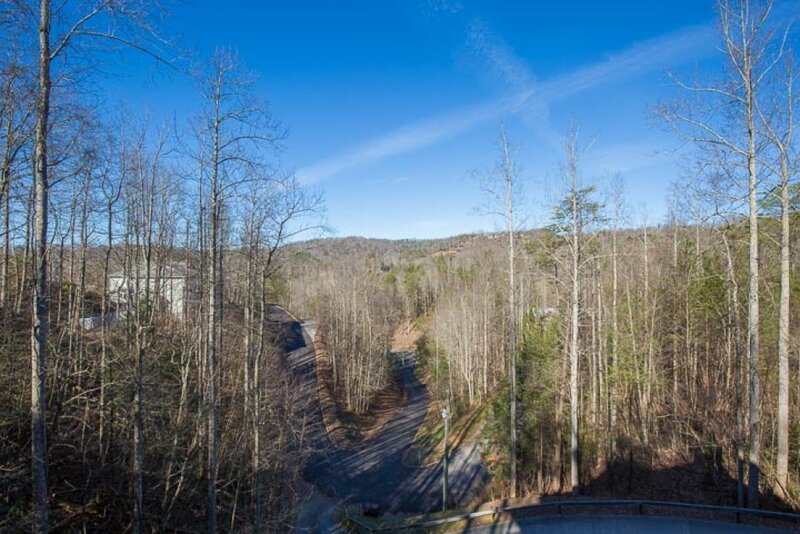 The driveway, which is steep due to the private location with mountain views, is safe and easy-to-drive in cars. Thanks and we hope to host you again in the near future! 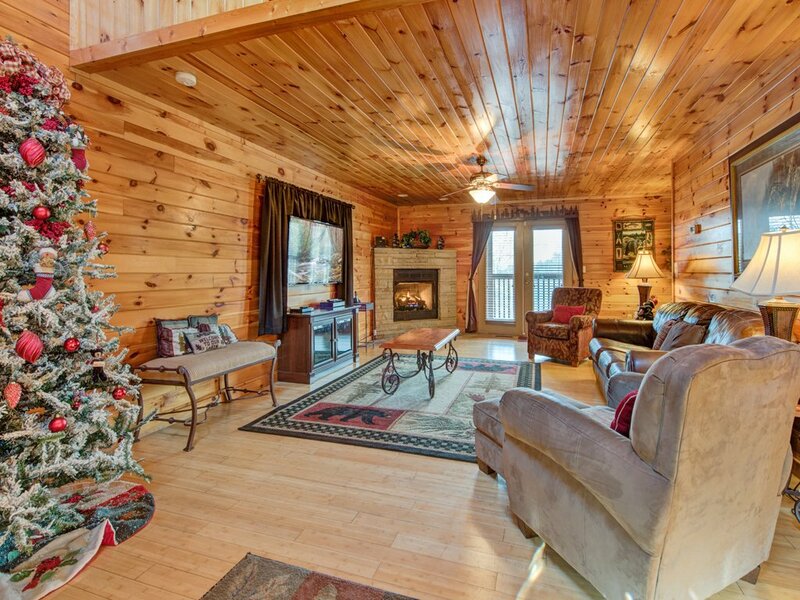 This cabin rental experience was wonderful!! 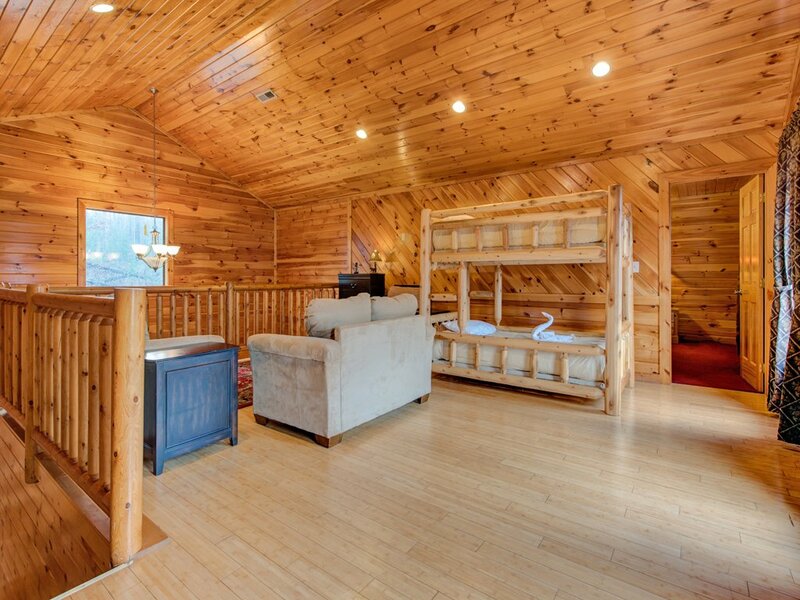 We booked it late (after our original AirBnB cabin fiasco), but everything went smoothly at Apple Bear Lodge. Fantastic location! Pictures were accurate! 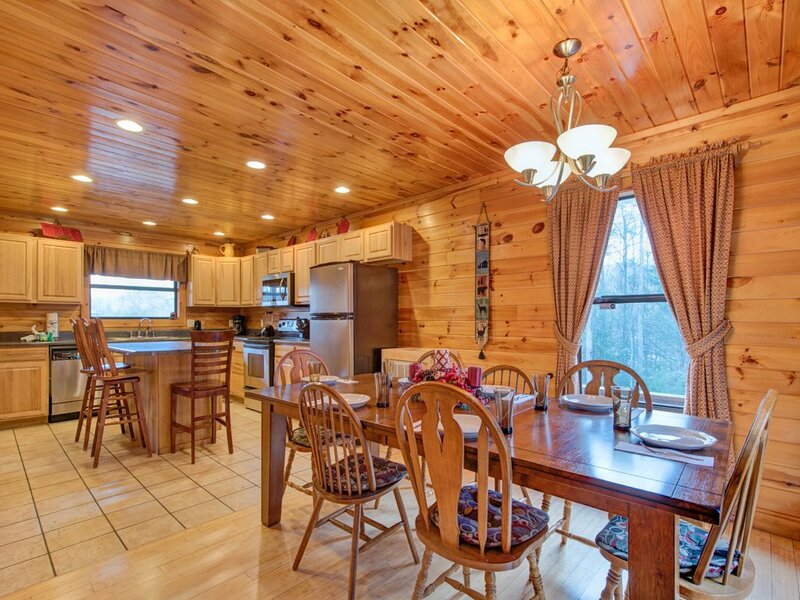 Great cabin for multiple families! Spent a week with five adults & five kids aged 9 - 19. 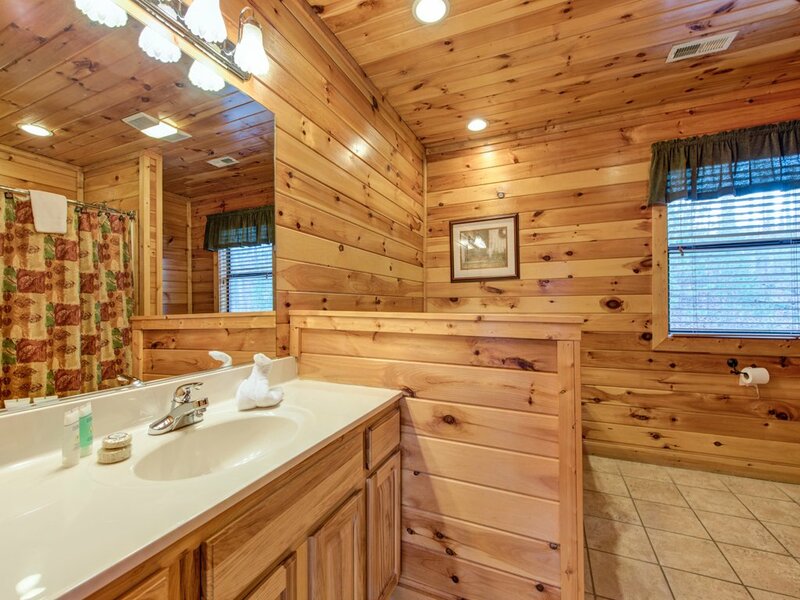 The cabin was very clean and well equipped with (almost) everything we needed. 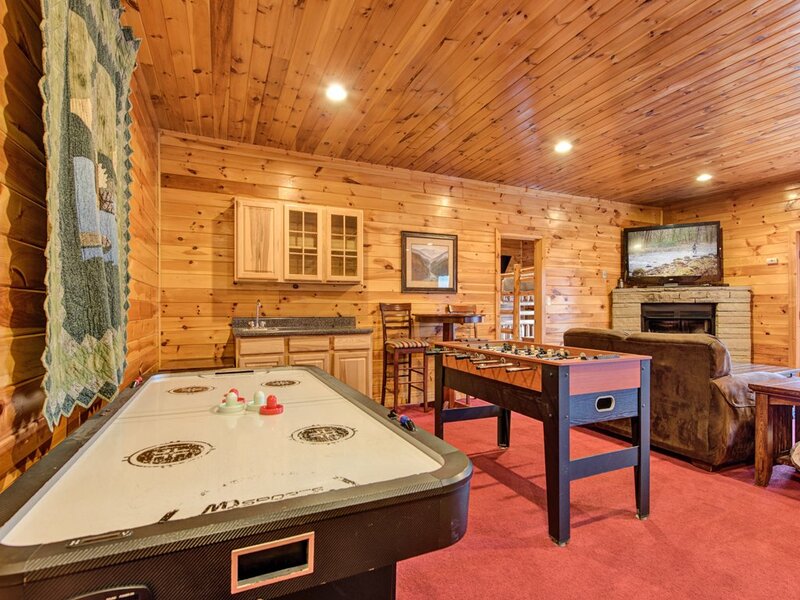 The kids loved the hot tub and game room. 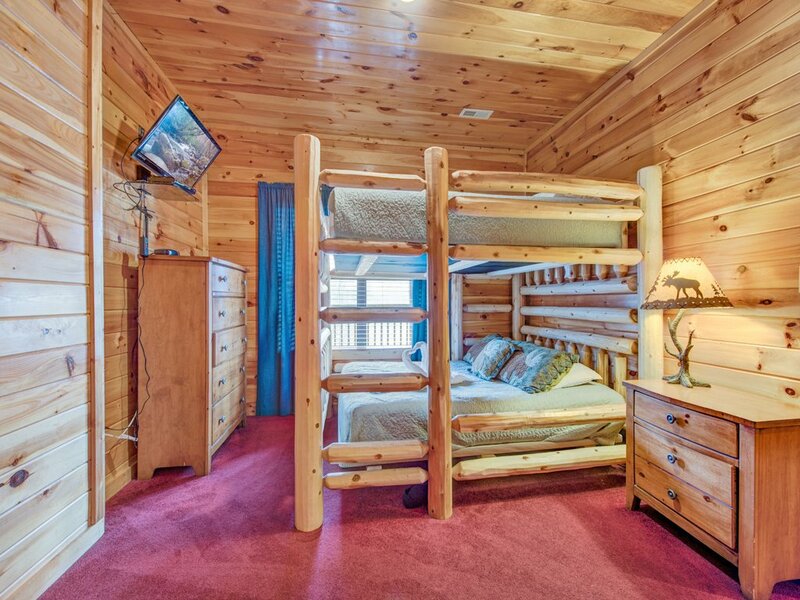 Accommodations worked well except for the fact that kids sleeping in the loft or in the game room had no access to a bath other than through one of the bedrooms - a point other reviewers have noted. 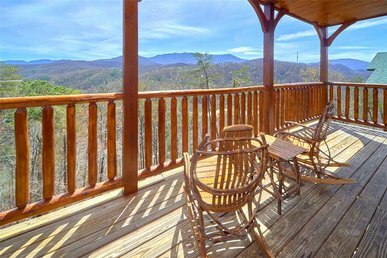 Location off East Parkway is convenient to Gatlinburg, and the mountain view from the rocking chairs on the upper balcony was pretty. (Aside - a couple of ceiling fans there would have made it perfect! )Only a couple of nits: First the garbage situation. Instructions were to put garbage in the outside bin, which contained only 2 regular-sized cans. When we arrived, the cans were already full, so we had no place to put garbage. Assuming that municipal pickup would be coming shortly, we kept garbage inside until 5 days into our visit. After calling the office, we learned that garbage is handled by the rental agency. They promptly sent someone to empty the bins, but the rental instructions should have pointed out there is no municipal pickup for this cabin. Second nit: The pans in the kitchen were old and two had burned-on deposits in them. It took two brillo pads and 30 minutes of scrubbing to make them usable. 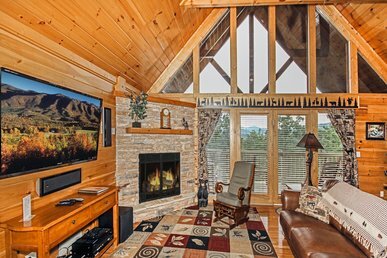 Third (very minor) nit: The DirectTV remote in the main floor bedroom was not programmed for the TV, and there was no TV remote, so it had to be manually turned on/off at the set.Overall, we had a very pleasant stay and would recommend considering this cabin for your Smoky Mountain vacation!